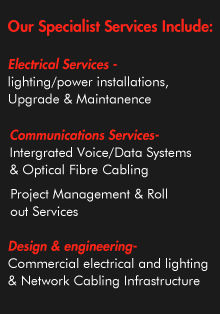 R W Palmer Electrical Service can tailor a Service and Maintenance Agreement for any situation. From a 24/7 rapid response help desk service agreement to scheduled monthly, bi-annual or annual services ranging from General lighting to Generator Back-up Systems Lighting. Our expert technicians are well positioned to carry out the design, supply, installation and maintenance of Exit and Emergency lighting systems, to meet Australian Standard 2293.1.2005 & BCA regulations. With regular inspection and well managed maintenance schedules, R W Palmer Electrical Service will perform the required 6 monthly and annual testing and test switch installations supported with the necessary documentation required (form15A). With our extensive experience within the trade & strict compliance with regulations, our team can provide auditing, verification and rectification work of any electrical and communications installation. Electrical- Whether it is to meet you Insurance policy compliance or Workcover safe working environment requirements, our team can report, advise and carry out the necessary rectification works to meet these obligations. Communications - Your communications structured cabling system is only as good as your weakest link. We can carry out the required inspections, testing to AS/NZ standards and necessary upgrade works to strengthen the network. This may be as simple as providing appropriate labeling, patching management and CAD communication layout drawings. With our successes in large project management and through our alliances within the industry, R W Palmer Electrical Service can guarantee that our clients will receive the most suitable, beneficial and cost effective project solutions for their requirements. R W Palmer Electrical Service aims to assist our clients in reducing costs through exceptional design and installation initiatives & efficiencies which are continually monitored to ensure our success. Proven methodologies in management and delivery.